The challenge follows on from Wrapping Presents. Here's a model of a small auditorium. 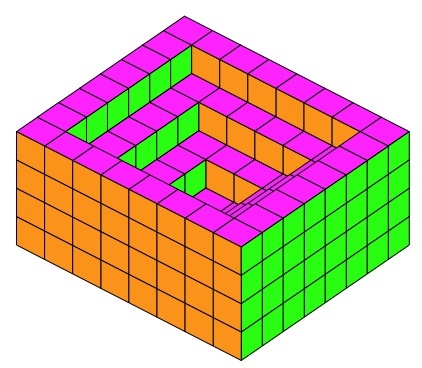 There are four squares at the bottom inside and there are three sets of steps to the top. To help to visualise it I've coloured each face of the cube blocks according to which way they are facing. Your challenge is to imagine that this is a small model that is a present for someone and so it has to be carefully wrapped up with paper. We do not want to waste paper so the wrapping needs to be from a cut shape so that each visable face (no matter where you are viewing it from) needs to be covered CLOSELY with ONE LAYER OF PAPER ONLY and there is to be just ONE piece of wrapping paper. Draw the shape of that wrapping paper which would need to be cut out. Describe how you went about it and say what you can about the paper shape. Then ask yourself "I wonder what would happen if I ...?" Mathematical reasoning & proof. Games. Creating and manipulating expressions and formulae. Interactivities. Visualising. Working systematically. Nets. Cubes & cuboids. Generalising. Squares.